A longboard is similar to a skateboard, but the difference is in the name. You guessed it! A longboard is longer than a skateboard. Well at least in most cases. Longboards come in all shapes and sizes, the trick is getting a board that matches your preferences. Longboards are most commonly used for either downhill racing, cruising, or transportation. Due to its longer and wider base, a longboard is more stable, making the ride generally safer and more comfortable than on a skateboard. Although, for beginners, it may be hard to ride down hills at high speeds. Their greater weight makes them less suitable for many tricks, but contributes to a fluid motion by giving more momentum. Thus, a longboard will roll farther with a single push of the foot. Many people therefore prefer longboards to normal skateboards for cruising on streets and sidewalks. Longboarding is often compared to surfing on concrete, and the size gives riders the option of performing big turns and quick short carves just like on a surfboard.Carving is way of turning that is mostly used when one is going 12 mph or more. Beginners to the sport of longboarding are frequently overwhelmed by the number of choices and perceived specialization of different varieties and brands of decks. However, there is some common advice that is often offered to beginners. Beginners should avoid models marketed as “beginner” or “disposable.” As in many sports, low quality equipment can turn beginners away from a sport before they even have a chance to experience it. Mid-length boards, (39 to 50 inches) are the most versatile. Beginners should avoid overly long or overly short boards, which are better for certain styles, but are less versatile, and may be more difficult to ride. Boards used for transportation or commuting are the most common types of longboards. The boards are usually 100-130 cm (39.0-50.3 inches) long and do not have a shorter nose. 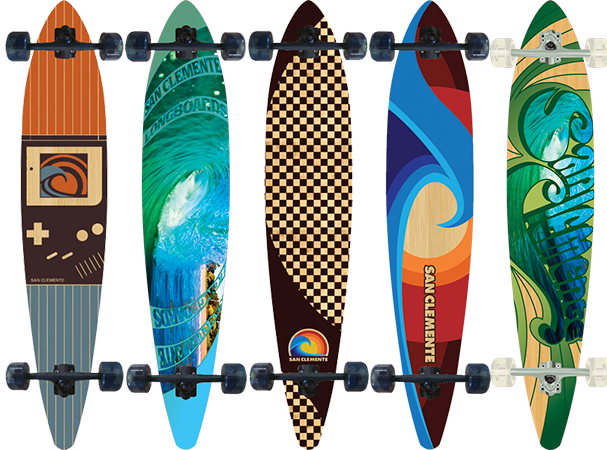 The boards are flexible to provide a more comfortable ride and are often shaped to resemble surfboards. Their trucks are set up loosely to allow for narrow turns. Longboarding for its own sake is often called cruising or, when going down a hill, carving. It can be a convenient alternative to walking as you only need to push one time to move several feet. Downhill skateboards are used for riding down mountain roads as fast as possible. The boards are usually 95-110 cm (38 – 43 inches) long and very stiff. The trucks are attached to the ends of the board to maximize the wheelbase. In order to lower the center of gravity, downhill longboards sometimes feature a lowered platform, by mounting the deck below the baseplate of the axles, or by the shape of the deck itself. Downhill skateboarders sometimes use streamlined helmets to reduce aerodynamic drag. A longer wheelbase will increase stability, when a shorter one increase the turning potential of the board. Cruising is often used to show off skill and control over the longboard. Cruising is a relaxed style, usually performed at slow speeds and involving tricks imported from classic surfboarding such as hanging ten, cross-stepping, and drop-knee-turns. Cruising longboards are typically much longer then the usual longboard, 150 – 200 cm (60 to 80 inches) or more, and often closely resemble the surfboards that they borrow their style from. Trick boards are similar to the short skateboards in shape and construction but are longer and usually wider. The trick boards are seldom longer than 110 cm (42.9 inches). Tricks that can be performed on these boards are the same tricks that can be performed on a short skateboard but the heavier weight and larger size of the board require more skill and strength from the skater. A drift is when the board loses traction around the turn. It is a controlled movement designed to reduce speed or to impress spectators. The same equipment is used as for a slide; the only variation is in hand positions. Drifting is most commonly used in downhill racing, to negotiate turns that are entered at high speed or are too tight to make. Controlled sliding (drifting) is also common in slalom competition and is used for similar reasons. Drifting can also occur accidentally when carving. Air braking involves standing upright on your board as tall as possible with arms outstretched to catch as much wind resistance as possible. This is primarily done in speed boarding to reduce speed but is not an effective way to stop. This only works at high speeds. Foot braking involves putting one foot on the road while balancing on the board with the other foot. This technique can be used to reduce speed or come to a full stop. Carving is an effective way to control speed when traveling downhill. Instead of coming to a complete stop, the rider makes a continuous “S” path by leaning left and right. By making so many turns the speed can be controlled and maintained. Slide braking or sliding is very important skill for longboard skaters who regularly downhill. To slide brake the skater quickly turns his/her board sideways into a controlled slide, to stop. A slide can be performed backside or frontside. With practice a skater can burn off speed very quickly in a relatively narrow roadway. Generally a skater sliding should have gloves because a hand is often placed on the ground for balance and control in the slide, however it is possible to slide to a stop, while moving less quickly, either hands-free or with minimal hand to ground contact. Boardwalking is a technique that consists of moving ones feet, in front of, or behind, the other (cross-stepping) up and down the deck. Usually this technique is practiced by a longboarder with a longer deck (40+ inches). Different variations of boardwalking depend on the imagination of the rider. Twists, turns, hopping, jumping etc. can all be considered more technical variations of boardwalking. Due to the greater speed involved while going downhill (often 30+ MPH), riders should wear padding and protection at least as protective as that used for a short skateboard. 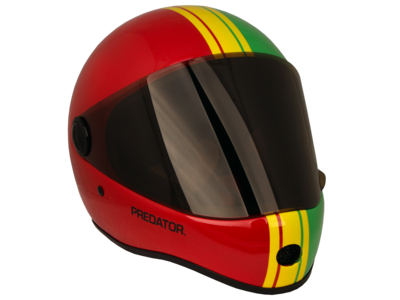 However, for higher speeds and riskier courses, professional riders often use safety equipment on the same level as that used by motorcyclists and dirt bikers, such as full Kevlar suits. Other than traffic, the greatest danger to any board rider is a “speed wobble,” a situation where excessive speed combined with a less experienced rider and/or a poorly suited board for the course causes the board to swerve rapidly from side to side, throwing the rider off. This risk can be minimized by using a longer, less “turny” board with a lower center of gravity and harder bushings, as well as controlling one’s speed or making a very soft side-to-side weave down the course. If one is thrown off the board by a speed wobble, one can minimize possible injury by leaping for soft dirt or grass when available, performing a running stop, or performing a rolling stop. Longboards are banned in many public areas such as boardwalks and parking garages due to the risk of an unskilled longboarder injuring a pedestrian or damaging property. *As a result, it is often a good idea to longboard at night and avoid crowds/law enforcement so as not to draw negative attention to longboarding. * However, if one rides at night, there is a higher likelihood of being hit by a car or failing to see obstructions. Even the smallest crack in the road can throw off a longboarder, and at speeds of 60+ MPH, such a mistake could be deadly. Ideally, night-time boarding should be done in a well-lit, low activity, suburban setting to ensure maximum safety. Furthermore, if you choose to board in less than optimal lighting conditions, make sure you make yourself familiar with the road during daylight hours so you are aware of any potential obstacles that you may not be able to see in the dark. It is also a good idea to practice power slides in order to stop quickly while moving fast. Likewise, longboarding is also banned in many public areas due to its association with the property damage and liabilities caused by street/trick skaters. Boarders should use caution and good sense at all times to keep longboarding from being banned on further hills and parking garages, as the sport is practiced almost entirely on public roadways. If you spend the majority of your boarding time in the realm of a neighborhood, be as considerate as possible. Watch out for cars backing out of driveways and, especially, small children that may be entirely unaware of you or the damage you could cause them. I’ve been longboarding for several years and even I learned a couple things. Very interesting page. I always see people on longboards. This is a great resource for beginners! A lot of useful information on here. I’ll definitely be back! Longboarding is the only honest hobby I have! I’m looking for a new hobby, but I don’t want to put myself in a dangerous situation. Any advice? You’re so cool! I do not suppose I’ve read through a single thing like this before. So wonderful to find somebody with unique thoughts on this issue. Really.. many thanks for starting this up. This web site is something that is required on the web, someone with some originality! Does anyone know the name of the longboards upon this aticle? The first looks like, it wants to have me as it’s owner. 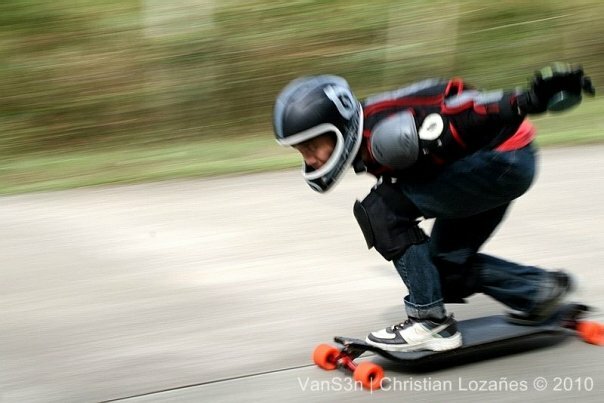 Nice, informative and valuable article about longboarding. I love longboarding very much, you touched every points of this sector.